Winery operations are for applying daily treatments and additions to tanks containing wine. 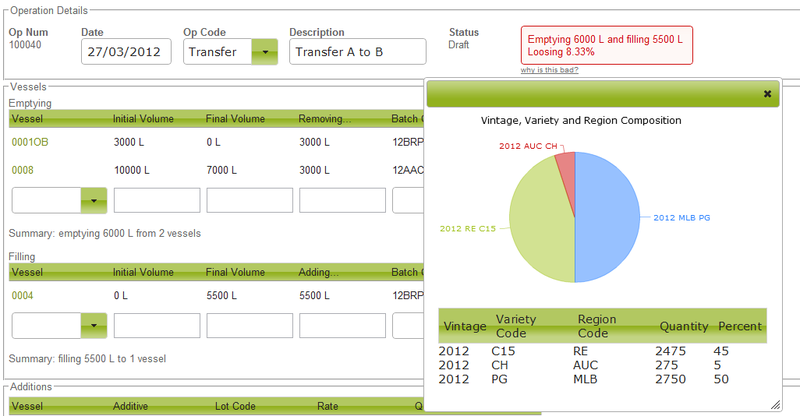 You are able to select from a list of various operation types to track the life of your award winning wines. 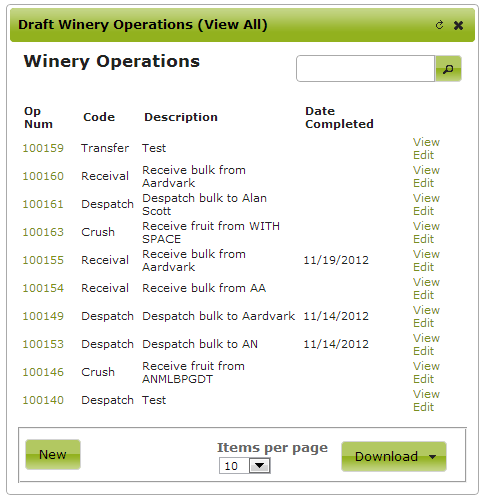 There are two places to view and search lists of Winery Operations: the Workbench and the Winery Operations page. The workbench will show you the most recent draft operations. Draft operations are able to be edited and deleted. Once an operation has been marked as updated, it is considered completed and will no longer appear in your workbench. 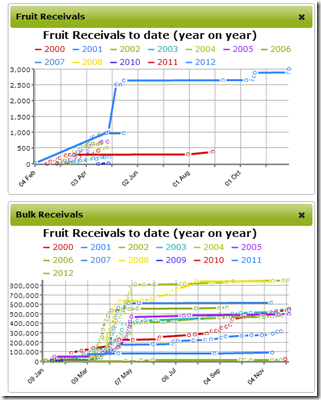 Also included on the workbench are graphical representations of the accumulated Harvest and Bulk Receival volumes over the current and past vintages. This gives you a bird’s-eye view of how production looks from year to year. 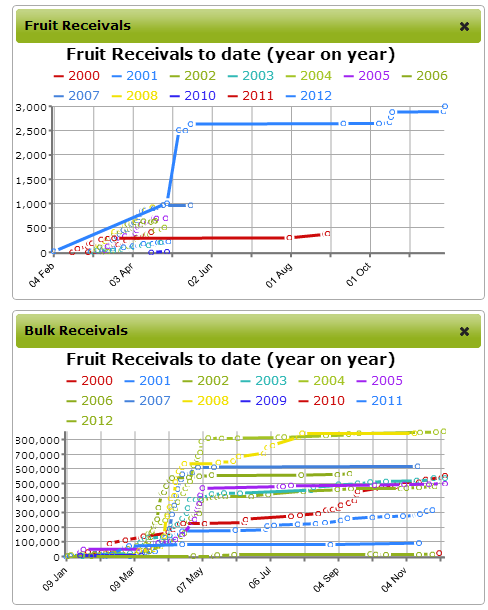 Simply hovering your cursor over the graphical points will give you the figures over the months and years. 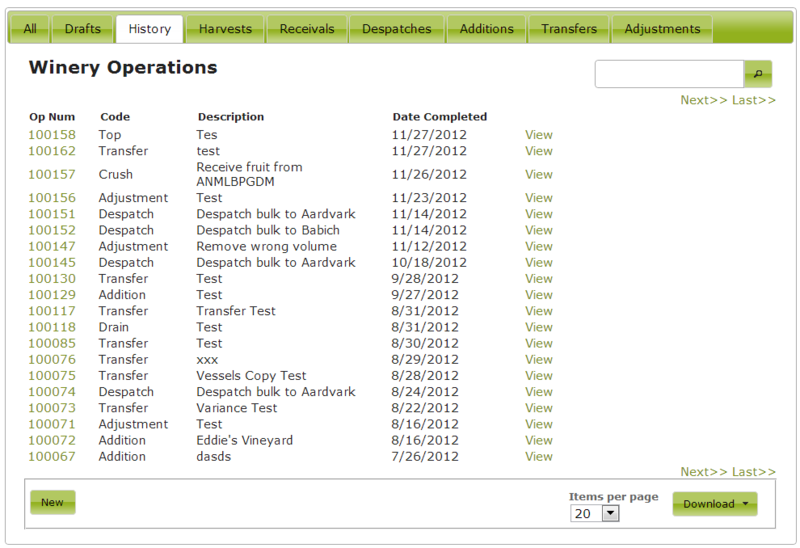 To get to the winery operations page, you can click the “View All” link from the winery workbench. This will take you to a page that has sorted lists of operations including Drafts, History, Harvests, Receivals, Despatches and Additions. 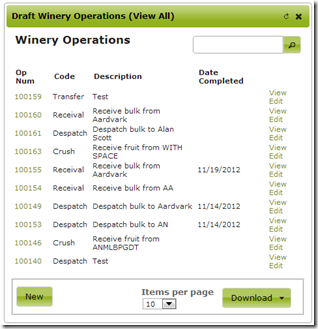 You can search within the winery operations or workbench pages by typing a keyword or words of your winery operation description in the space provided and clicking the magnifying glass. You are required to select an Op Code or operation type. Then enter a short description of what you’re wanting to achieve. Select the ‘Save and Edit Operation’ to proceed to the winery operation. 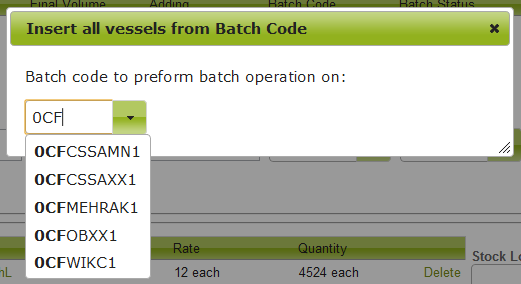 Other requirements for processing operations are to have listed valid vessel codes and batch codes. Dry goods for additions also need to be pre-entered from the ‘Bottling and Inventory‘ tab. The Op Code you have selected for the operation will determine what parts of this page you will see. The ‘Emptying’ vessel table is where you select vessels containing the wine you want to work with. The ‘Filling’ vessels usually contain empty vessels you want to transfer wine into, or containing wine you want to blend with. Treat the Emptying vessel line as the ‘From’ and the Filling vessel line as the ‘To’. 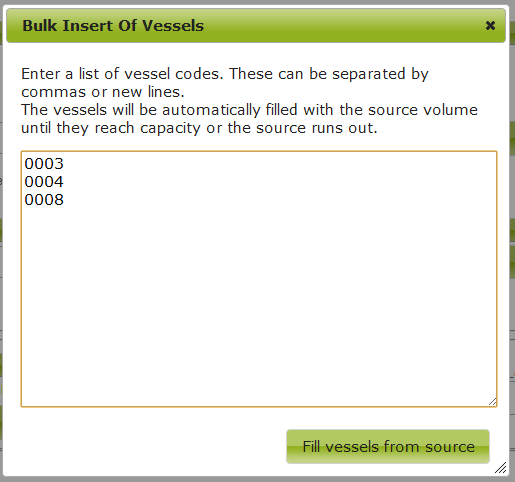 To fill out an operation, you must add vessels to it. 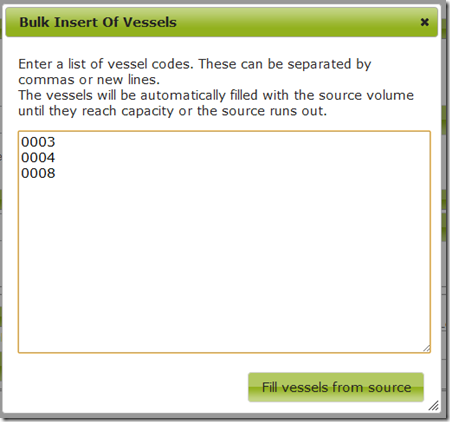 To add a vessel to a table, select it from the Vessel drop down list. Its current volume will be inserted under Initial Volume. Then you can change the Final or Transfer Volume and the other values will be calculated for you automatically. 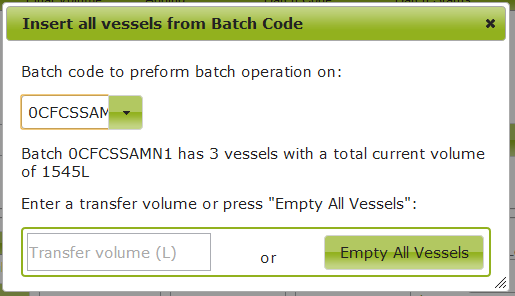 Each vessel entry must include a Batch Code as well. Using a winery operation, you are able to create a trial blend and preview the blend composition. This is very useful if you need to confirm that you will meet your vintage, variety and region criteria for your LIP/blend classification. 1) Simply add the tanks or barrels you want in the blend into the emptying side of a winery operation, and remove the wine you want to blend from them. 2) Put a single tank on the filling side of the operation to represent the blend, and fill it. 3) Move off the line to save it then use the context menu to select "Preview Composition". 4) Make changes to the blend and see how the blend would change based on your trial blending. Once satisfied, you can use the operation as a work order in the winery. WARNING: The Preview composition feature currently has limitations as to when it will produce the correct graph for you. You should only rely on it’s output when doing a simple blend or transfer like the one above. I.E. there are multiple vessels in the source table and only ONE vessel in the destination table. When you save an operation, it is still just in a draft format. None of the changes you have specified will actually happen until you press “Save and Update” at the bottom of the page. This completion is referred to as Updating an Operation. When you update an operation, the wine will be blended and move between tanks and stock items will be taken out of your inventory to be used as additives. If you have updated a Winery Operation and you need to edit some of the details, then you will have to undo the update before you can make changes. This can be done by pressing the "Undo Update" button at the bottom of an updated Winery Operation. It must not have any updated operations further down the chain. For example: If you updated Operation 1 that moved some wine into Vessel A, then you created and updated Operation 2 that adds PMS to Vessel A, you would have to first undo Operation 2 before undoing Operation 1. An undo operation will not restock any additives that have been used in that operation. 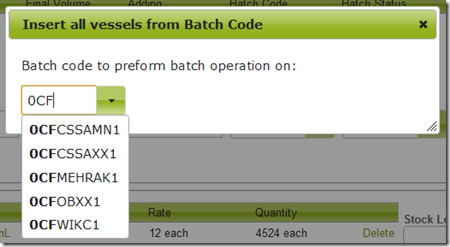 For now, you will need to restock them manually by creating a Purchase Order. You can enter a volume to transfer or leave it blank to completely empty the vessels. When you press the button you will be asked for confirmation. 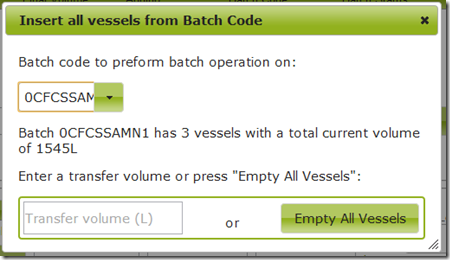 Then it will go and do that operation to every vessel in the batch. You can assign three types of operators for any one job (if you have a large subscription). 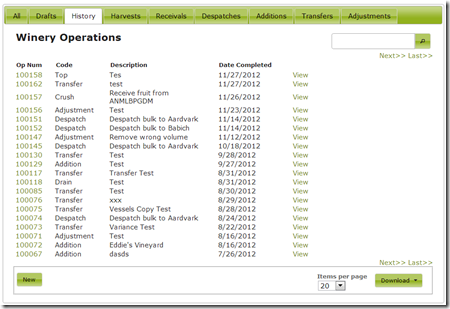 To do this, go to the Operators section at the bottom of the winery operation and pick names from the drop down lists. You can use the keyboard shortcut CTRL + " (like ditto speechmarks) to copy the value of the row above the one you are editing at the moment. This will work whenever you have your cursor in an input box while editing a winery operation.